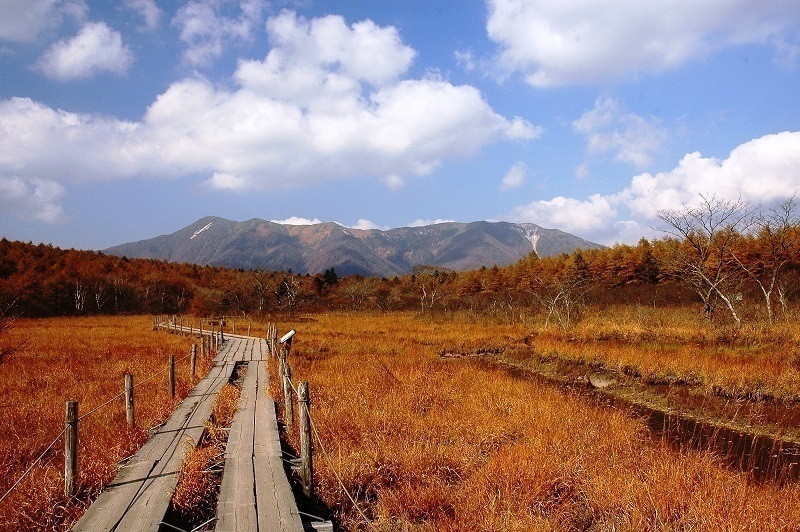 Numappara Marsh is a sub-alpine wetland located at the altitude of 1,230m in Nasu Town, area of 250m East/West and 500m North/South, which is the Westside of Hinode-daira and the Southern-most tip of the Nasu mountain range. Although it will not colour a flashy red nor yellow, whole area is covered like a rugged orange carpet. It is a perfect place for hiking in autumn leaves without using trekking equipment because you can get to the marsh by car. Come and spend a relaxing time surrounded by autumn leaves. On the other side of the main gate of Nasu Highland Golf Club, there is a municipal road to Numappara parking lot. ※ For GPS, set Nasu Highland Golf Club (Tel: 0287-69-1007) as the destination and take the municipal road. (Note) There is no regular bus service to Numappara parking lot, please take a taxi or hire a car.